ISO 22716 defines guideleines of good manufacturing practice (GMP) for design and production of cosmetics and has become an elementary requirement for numerous wholesalers and retailers. Rhein S.Q.M. is looking back on many years of experience in the cosmetic industry and can offer comprehensive support for the certification process, incl. documentation, audits and coordination with accredited certification bodies. 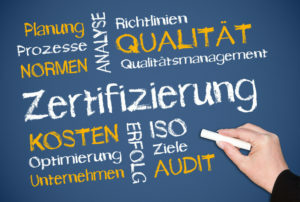 We guarantee uncomplicated and successful implementation of all your certification projects and also offer continuous support for your business-specific ISO 22716 system after certification. You will be in a position to fulfil ISO 22716 requirements regarding personnel, factory premises, equipment, basic raw material, packaging material, waste management, out-sourcing, quality assurance and control, risk management, complaints management, change control and verification management. Rhein S.Q.M. will ensure close cooperation with your own staff and will develop solutions that match your business needs, without creating an overload of documentation.